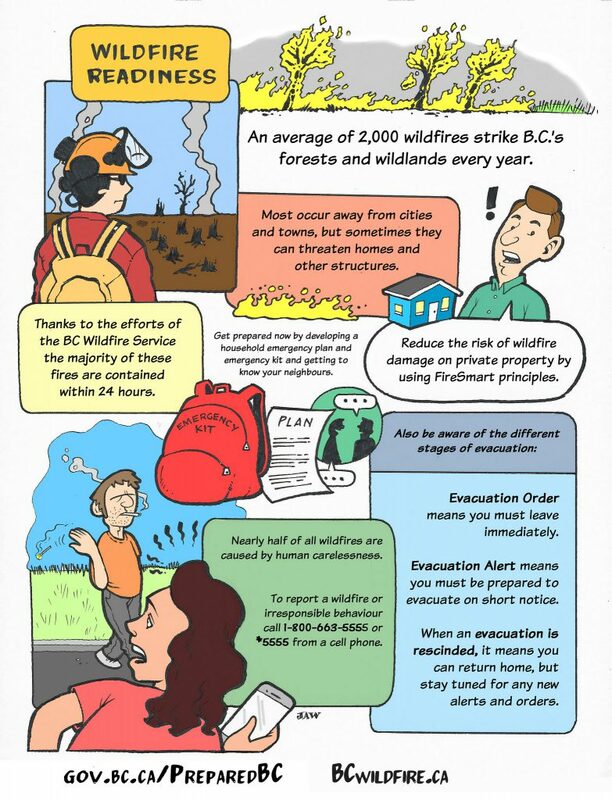 Many BC wildfires occur far from cities and towns, but sometimes they threaten homes, businesses and infrastructure, such as highways and bridges.With hundreds of wildfires heating up around the province and not showing any signs of cooling down soon, we thought a roundup of wildfire preparedness tips and evacuation information was in order. 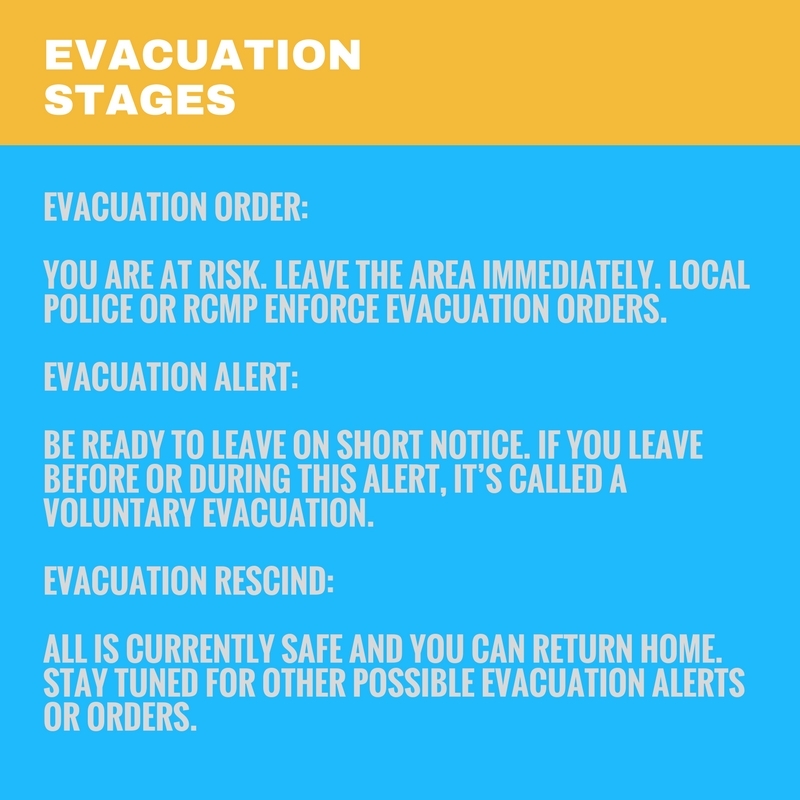 We asked our friends at PreparedBC for more information and they shared all of the handy and helpful tips below to help you prepare for a wildfire emergency and the possibility of evacuation. Help keep your family safe by preparing in advance for a potential evacuation alert or order. Develop a household plan. It will help you cope with the stress of emergencies. Put together your emergency kit. When disaster hits, there won’t be time to collect emergency supplies. 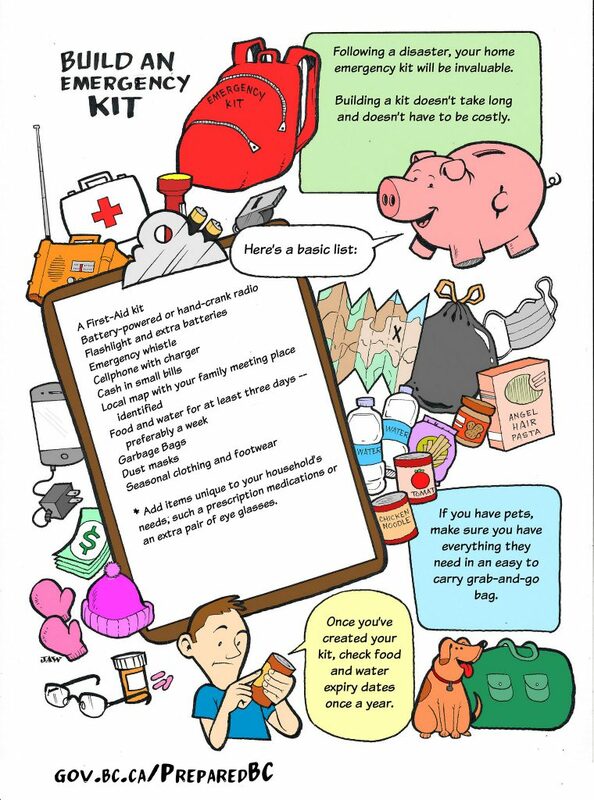 Ensure you have emergency kits for your home, workplace and vehicle. They should all contain food, water and supplies for a minimum of 72 hours. A week or longer is better. Connect with your neighbours. When disaster strikes, we’re in it together. The most immediate help following a disaster will come from those directly around – your neighbours. Connecting with them today, and working together to prepare, will mean a better response and faster recovery. If you care for animals as livestock you need to have a preparedness plan and a plan for relocating your animals. Preparing for and responding to hazards such as wildfire requires special consideration of seniors’ needs. Seniors who live alone, or are sick or disabled will need special support and an emergency plan. In such stressful circumstances, the most important thing to remember is to stay calm, listen to local public officials, and if possible, access online social media channels like Twitter or your local government website for information updates. Plan to take your pets with you (in kennels or on a leash); do not leave them behind. Because pets are not permitted in public shelters, follow your plan to go to a relative or friend’s home, or find a “pet-friendly” hotel. After your local government has declared the evacuation order over, you are free to return home. Here are some steps you can take to make the transition easier and safer. You’ve been through a traumatic event. Whatever the emergency was, the danger is past. But in your mind, you may still see the event clearly –and feel the fear and anxiety it caused. These feelings are a normal, natural reaction to a traumatic event. The key is to remember that you have survived. These feelings will diminish and for most people, completely disappear. It will take time, and you may need help, but you will put the natural disaster behind you. Recovery is a process and this booklet is a great start. Think about ways you could have been better prepared and make any changes to your emergency plan in light of those issues. Visit PreparedBC and the BC Wildfire Service for more information. BC has an average of 2,000 wildfires each year? Thanks to our highly trained wildfire crews, 92 per cent of them are contained to four hectares in size or smaller. The numbers to call if you spot smoke, flames or an unattended campfire? They are 1 800-663-5555 or *5555 on your cell. You can (likely) still use a CSA- or ULC-rated gas, propane or briquette campfire or stove, even if there is a campfire ban? The flame has to be 15 centimetres or smaller. If you live close to a forested area, you can take steps to reduce the susceptibility of buildings and property to fire? Download the FireSmart Homeowner’s Manual or visit the FireSmart website. Do you have any questions about this or anything else the BC Ministry of Transportation and Infrastructure does? Let us know in the comments below.